1. 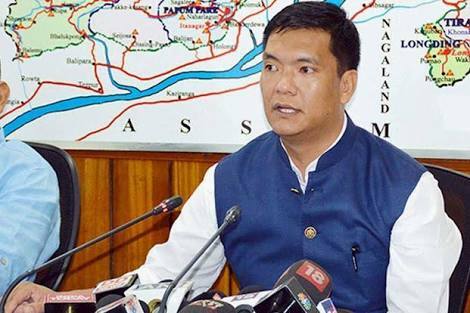 Pema Khandu : Chief minister. 2. Chowna Mein : Deputy chief Minister, Finance, Planning, PWD. Development & Art and Culture Minister. 5. Bamang Felix : Public Health, Engineer Department Minister. Urban Local Bodies, Law and Justice minister. 7. Jomde Kena : Health and Family Welfare Minister. 8. Alo Libang : Panchayati Raj and Rural Development. 9. Kamlu Mossang : Water Resource Development, Food and Civil. 10. Wangki Lowang : Tirap, Changlang and Longding (DoTCL). 11.Honchun Ngandam : Education and Libraries. 2. Kiren Rijiju :- MP (Lok Sabha) West. 3. Ninong Ering :- MP (Lok Sabha) East. Shri T.N Thongdok :- Deputy Speaker of Arunachal Pradesh. Shri P.B. Acharya :- Governor of Arunachal Pradesh. 1.Thangwang Wangham :- Power (Electrical). 2. Gojen Gadi :- WCD, SJETA and Land Management. 3. Phurpa Tsering :- Health Services. 4. Tirong Aboh :- Geology and Mining. 5. C.T Mein :- Environment and Forest. 6. Punji Mara :- Horticulture. 7. Phosum Khimhun :- Hydro Power. 8. Jambey Tashi :- RWD (rural Work Department). 9. P.D Sona :- Tourism. This are the list of latest Cabinet ministers, Governor, MPs and parliament secretaries names of Arunachal Pradesh State . Hope this will help you in knowing the Cabinet Ministers names of Arunachal Pradesh. 0 Comment to "CABINET MINISTER OF ARUACHAL PRADESH"